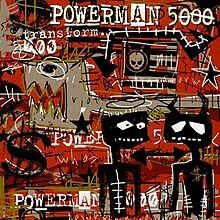 Transform is the fourth studio album by American industrial rock band Powerman 5000, released May 20, 2003. It is an enhanced CD that includes the videos for "Free" and "Action," the album's two singles. The album had sold 148,561 copies in the U.S. in 2003, before the band was dropped from Dreamworks Records. Transform marked, both musically and visually, an obvious change from Powerman 5000's previous science fiction theme. The band composed songs in a simpler, more straightforward manner with less emphasis on industrial metal and nu metal elements and heaviness. The video for its lead single, "Free," also demonstrated the band's visual stylistic detour; rather than space costumes, the majority of band members are dressed in denim while performing in a red room covered in graffiti, creating a colorful, punk rock influenced edge. The album artwork contains symbols reminiscent of the Amphisbaena. Adorning the CD artwork are four two-headed arrows wrapped back pointing at each other, the outermost one sprouting two extra arrows for a total of six on the right, and underneath the CD are two worm like creatures face to face forming a circle. In support of the album, the band announced they would begin touring through the U.S. in April, along with Stone Sour and Ra. They would also go on to appear as the musical guest on Jimmy Kimmel Live! (where they performed their song "Action"), and The Late Late Show (where they performed their song "Free"), respectfully. The band would also later begin to embark on a headlining tour along with Mudvayne and V Shape Mind, starting in September and performing in festivals such as X-Fest. However, DreamWorks Records was bought out by Interscope Records and had stopped promoting Powerman 5000 in the middle of the tour, forcing the band to withdraw from their tour. Later by December, frontman Spider One confirmed the split with Dreamworks Records. "Action" featured on NASCAR Thunder 2004 and was used as its introductory screen's theme. "Transform" was featured in Midway Entertainment's hockey game NHL Hitz Pro. "Free" was featured on the New Jersey Devils 2003 Stanley Cup Championship video. All tracks written by Powerman 5000, all lyrics by Spider One. Trixie Starr - Additional Vocals on "That's Entertainment"
^ "Transform - Powerman 5000". Allmusic. ^ Hoard, Christian (2003-05-20). "Powerman 5000: Transform : Music Reviews". Rolling Stone. Archived from the original on 2007-03-11. Retrieved 2012-04-22. ^ "Powerman 5000 Transform". KNAC.com. June 6, 2003. ^ "Powerman 5000: Is The End Near?". November 6, 2003. ^ "STONE SOUR, POWERMAN 5000: More Tour Dates Announced". Blabbermouth.net. April 1, 2003. ^ "The Late Late Show with Craig Kilborn Season 5 Episode 203". ^ "MUDVAYNE To Embark On Headlining Tour". Blabbermouth.net. August 22, 2003. ^ "POWERMAN 5000 Frontman Confirms Split With DREAMWORKS RECORDS". December 13, 2003. ^ "Powerman 5000 Transform Chart History". June 7, 2003. This page was last edited on 18 December 2018, at 20:40 (UTC).